April 21, 2014  It was particularly difficult to report from Afghanistan during the recent presidential election because members of the Taliban were trying to disrupt the voting. They were also targeting Westerners. April 4, 2014  Morning Edition co-host Renee Montagne is in Afghanistan following the leading candidates in Saturday's presidential election. The top-two contenders are: Zalmai Rassoul and Abdullah Abdullah. April 3, 2014  The three leading candidates in Afghanistan's presidential election are all urbane, Westernized men who usually wear suits. Yet their running mates range from notorious warlords to a woman. March 31, 2014  Voters in Afghanistan will elect a new president this weekend. 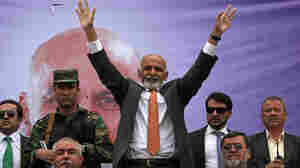 For the first time since America went to war there, President Hamid Karzai will not be on the ballot. March 20, 2014  A scrap metal dealer bought a golden egg at a flea market for $14,000 and planned to melt it for a profit. But he discovered it was a Faberge egg — given by Alexander III to his empress in 1887. March 20, 2014  In Brussels on Thursday, EU leaders will discuss stronger sanctions against Russia. Juan Zarate, a senior adviser at the Center for Strategic and International Studies, talks about their options. Wait. How Much Is That Doggy? March 20, 2014  A Chinese property developer has reportedly paid close to $2 million for a golden-haired Tibetan mastiff puppy. The lion-looking dogs have become a status symbol for China's very rich. March 20, 2014  David Wessel of the Brookings Institution talks about Janet Yellen's first policy meeting and press conference since taking over as chairwoman of the Federal Reserve. March 20, 2014  Australian officials say they are searching the Indian Ocean southwest of Perth after satellite images found objects that are possibly connected to Malaysia Airlines Flight 370. March 20, 2014  Starbucks is testing an evening menu that includes wine at more than 25 locations. Now, the company's chief operating officer says it plans to offer its nighttime fare at thousands of U.S. stores.